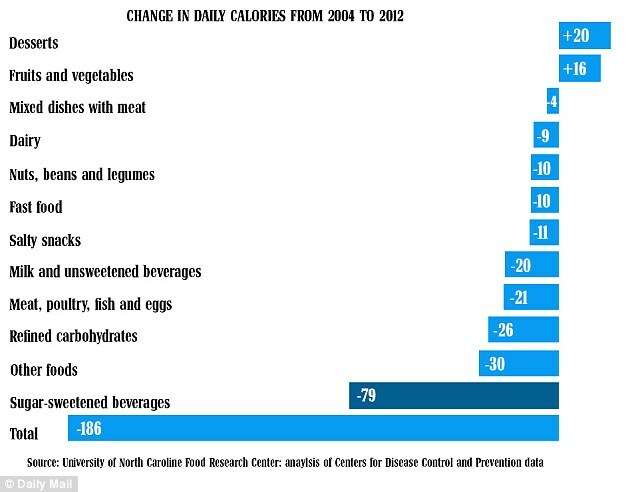 Americans are consuming fewer calories, finally, according to widespread media coverage of recent government statistics. But there’s still too much salt, fat and sugar in most people’s diets, in my opinion after looking at the statistics involved. “Calories consumed by the typical American adult, which reached an alarming peak in 2003 having risen inexorably since the late 1970s, are undergoing their first sustained decline since the US government started monitoring them more than 40 years ago,” notes the Daily Mail, a British publication that provides an interesting overseas view of America’s bad eating habits. “The most dramatic fall has been in the amount of sugary soft drinks consumed by Americans. The average American drinks 25 per cent less of such drinks than since the late 1990s, when he or she drank an astonishing 40 gallons a year,” the Mail reports. Salty snack consumption is down 11% from 2004 through 2012, according to an analysis of government data by the University of North Carolina Food Research Center. Consumption of milk and other unsweetened beverages is down 20% and consumption of meat, poultry, fish and eggs is down 21%. Consumption of refined carbs is down 26%, so the anti-carb message seems to have taken hold, although desert consumption is up 20%. I always wonder if people really know where refined carbs are. I also wish the survey had asked about salt, over consumption of which impacts people’s heart health but which so often is ignored in discussions of healthy eating. Check our smart shopping page to find items that can help you cut salt, fat and sugar, and in the process eat fewer calories.